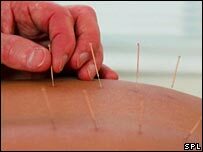 Acupuncture may increase the success rates of fertility treatment, according to a study. IVF involves fertilising the egg with sperm outside the woman’s body then putting the resulting embryo back into the womb. Studies have bee showing benefits. They found that, looking at all the research together, women who underwent acupuncture were 65% more likely to have a successful embryo transfer compared with those who underwent a “sham” version of the treatment, or no extra treatment at all.